As fall makes way for cooler weather, it’s time to start thinking about stocking up on your bird’s favorites during our Fall Bird Seed & Suet Sale. Take 20% off all seed, suet, and nectars! Learn more about our custom blended seed mixes and how to prepare your backyard for winter. Our Specialty Blends are formulated to attract birds specific to the Gallatin Valley and surrounding areas. Whether you live in the valley or foothills, we have the seed to need to attract the birds you want! 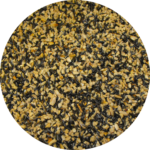 Big Sky Blend is designed to attract most birds that live in the valley or other open areas. It consists of striped and black oil sunflower seeds, sunflower chips, peanuts, tree nuts, and raisins. 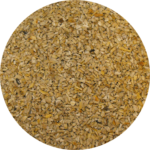 Mountain Mix is the blend for your local birds if you live in or next to a forested area, or in the mountains. 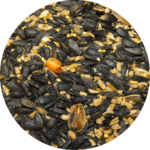 It includes striped and black oil sunflower seeds, sunflower hearts, peanuts and white Proso millet. 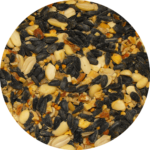 No-Mess Patio Mix is not only a great, high energy blend that can be used for year-round bird feeding; there are no shells! It’s made up of black oil sunflower chips and four types of shelled nuts. This is a favorite of chickadees, finches and sparrows. 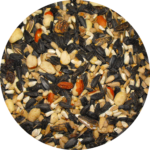 Chickadee Chow is our highest energy blend; recommended especially for wintertime bird feeding. 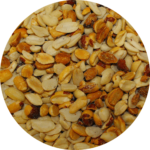 Packed with black oil sunflower seeds and five different nuts, it provides more energy with fewer shells. 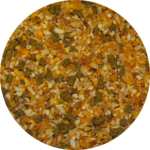 While many birds will eat this blend, it is a favorite of chickadees, finches and sparrows. 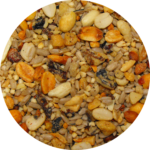 Finch Mix is a mix of fine sunflower chips and Nyjer seeds. It caters to the birds who prefer either of those seeds, like finches, siskins, flickers and doves. 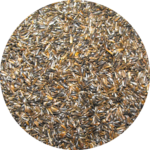 Game Bird Blend is mixed specifically for pheasant, grouse and the Grey Partridge (Hun). It’s loaded with wheat, oats, rabbit pellets, grit, and cracked corn. 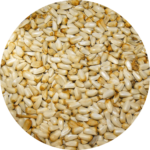 Our Unblended Seeds are a great option for attracting more specific varieties of birds while still providing a quality product. 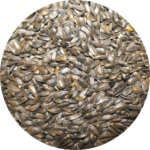 Premium Black Oil Sunflower Seed is probably the single most desirable seed because it has a high oil content heart that contains lots of energy and a thin black shell, making it easy to crack open for most birds. It’s enjoyed by chickadees, sparrows, finches, nuthatches, grosbeaks, redpolls and crossbills. Our premium product been cleaned of sticks, dirt, and shell bits, allowing it to flow better in your feeder. Medium Sunflower Chips are shelled, chopped Sunflower seeds. Their lack of shell means less mess for your and an easier meal for smaller birds who have trouble cracking the shell of regular seeds. They attract finches, siskins, flickers, juncos, chickadees and crossbills. Fine Sunflower Chips are the smaller cousin of Medium Sunflower Chips. They are readily eaten by flickers, juncos, chickadees, finches and siskins. Nyjer Seed is a small black thistle seed. It’s mainly eaten by goldfinches and siskins, but also favored by redpolls and doves. Safflower Seed is often called “the problem solver seed” because it has a hard shell and bitter taste which means it is disliked by squirrels, magpies, grackles and starlings. It is, however, enjoyed by finches, sparrows, chickadees, grosbeaks and doves. 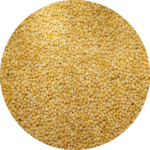 White Proso Millet is a little tan ball of seed favored by finches, siskins, juncos, sparrows, buntings, and doves. 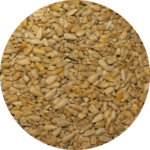 Be sure to serve this seed both in feeders and scattered on the ground to attract the most birds. 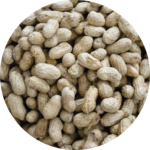 Peanut Pick-Outs are shelled, roasted (unsalted) peanuts. Because of their high oil content they are a favorite of chickadees, finches, nuthatches, grosbeaks and woodpeckers. In-Shell Peanuts are a high energy favorite of the jays, nutcrackers and squirrels. Rake around the base of your bird feeders, cleaning up the seed debris will prevent disease and pests. Nesting boxes should be cleaned. Birds may use them over the winter as roosts and some birds, especially Bluebirds, will look for potential spring nesting sites before leaving for the winter. Any feeder that will be put away for the winter, like finch feeders, should be cleaned before going into storage. Move your feeders closer to your house for easier access. If you don’t have to shovel your way out to them, you’re more likely to fill them. Be sure to periodically check the feeder ports for ice build-up. Plastic domes can be added to feeders to keep snow off and the seed dry. Put out suet feeders to provide a high-energy food source and attract plenty of birds. Bird baths should be stored or heated for the winter. Making sure your birds will always have access to water is also very important. Bird bath heaters are available to purchase at Owenhouse. Use the 10% bleach sanitizing solution to clean bird baths before storing them. Extend the life of concrete bird baths, which do not handle freeze-thaw cycles well, by storing them for the winter. Stock up on your bird’s favorites now through October 31st during the Fall Bird Seed & Suet Sale at Owenhouse!